As promised I am back with some more EMOJI FUN! As you know my daughter had an epic EMOJI party and then I shared about all of the fun details from the party but with the promise that I would share HOW we did some of those things. 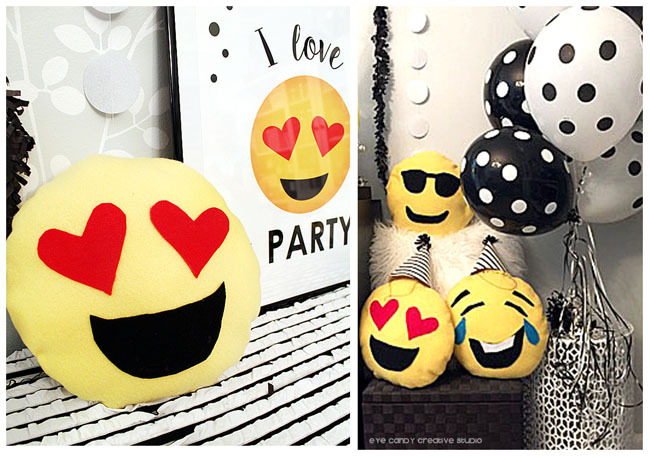 For years, I have always tried to come up with a 'cool' fun craft for the parties that my daughter has with her friends, and this year we decided to try our hand at making EMOJI PILLOWS. I figured they wouldn't be that hard as I could buy the supplies, sew them up ahead of time and then come party time, the girls could decide what 'face' they wanted their pillow to have. It was sure to be a WIN-WIN right? YES, YES it was . 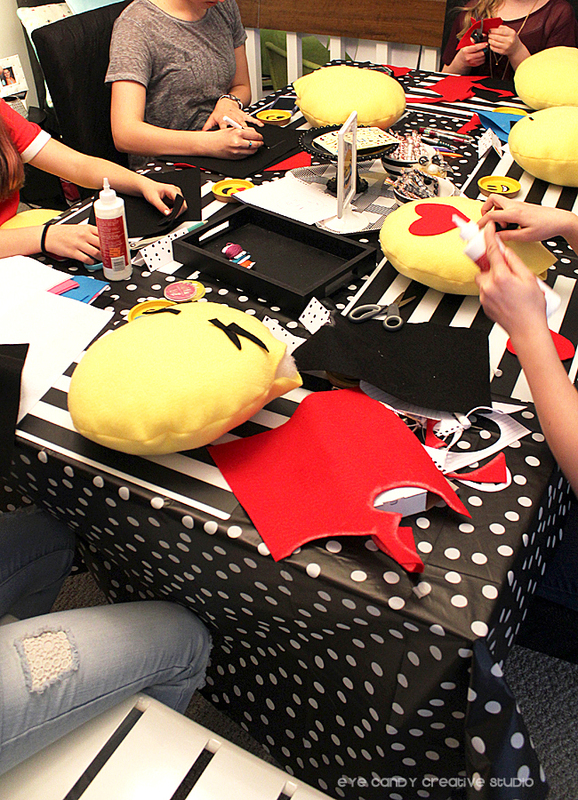 . . the girls had a blast and giggling so hard making their emoji pillows . . . it was awesome to hear them all having a good time with this. 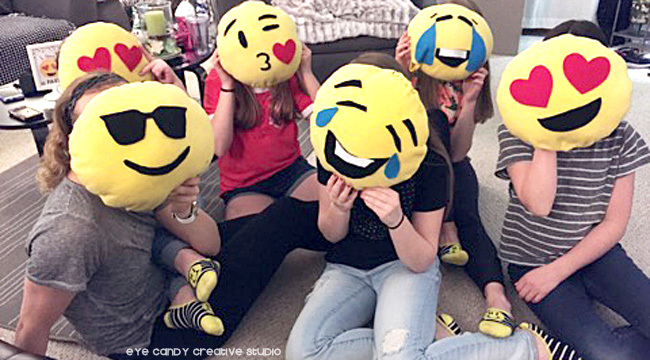 Of course, they used their emoji pillows at their sleepover as well. Could you just make your life easier and go buy a bunch of pillows at say . . . pretty much any of the stores right now? . . . well yes, but by MAKING them, you get the fun experience of personalizing them to the emoji that they want and watching all of your daughter's friends have themselves some fun! 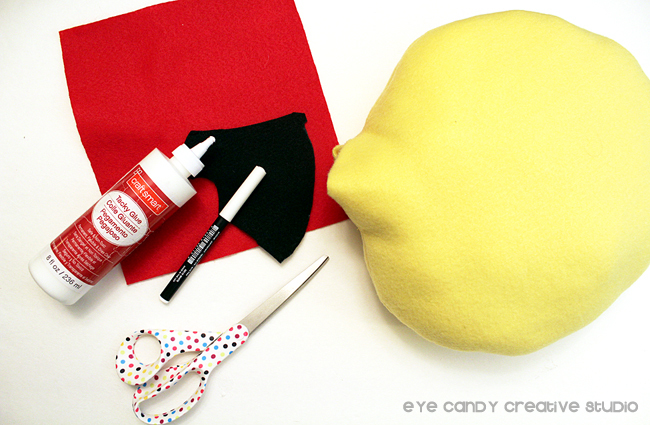 soft, high quality yellow felt (bought by the yard) I used about 2.5 yards to make eight pillows, various pre-cut colored felt to use for the emoji faces, scissors, a glue gun and/or fabric glue, yellow thread, sewing machine, pencil, stuffing, straight pins and a round 12 in plate or similar object to trace for the circle pattern. 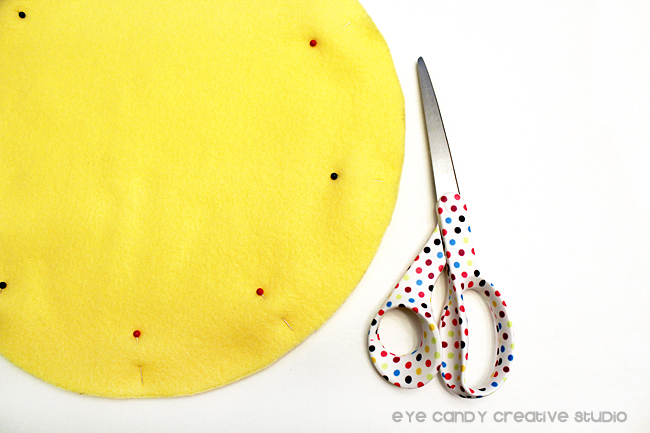 2. trace your circle shape using your plate onto the yellow felt, keeping the fabric folded so you get two circles with each trace/cut. 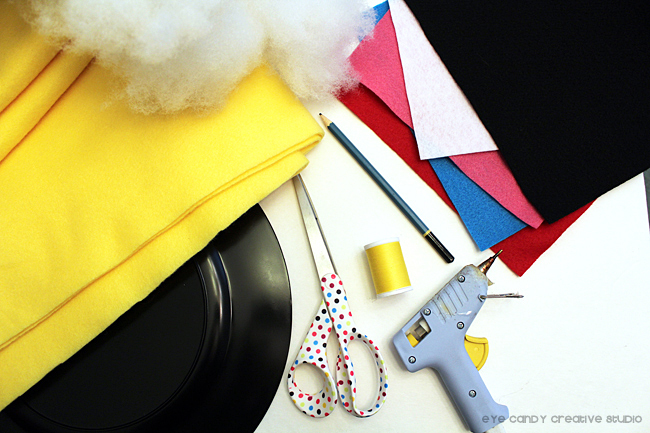 3. pin the two layers of felt together to ensure they stay the same when you cut and sew. 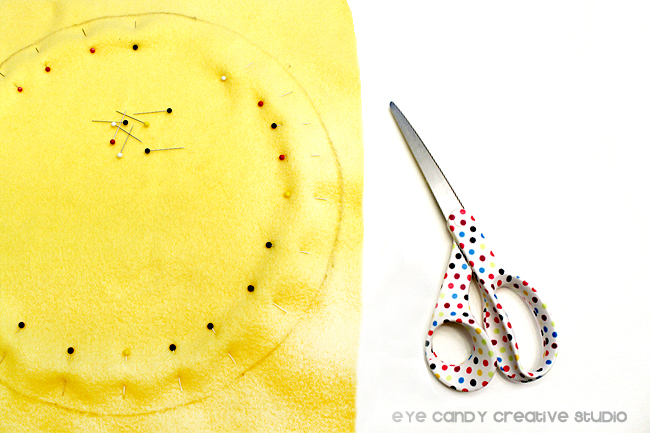 5. sew & stuff: using your sewing machine (if you choose), sew in a complete circle leaving about a 1/2 inch seam around the edge. Make sure to stop about two inches from closing, so you have a gap so you are able to fit the stuffing inside. Take your pillow and turn it inside out so the seams are on the INSIDE of the pillow now. Take your stuffing and fill it until you get the desired firmness for your pillow. 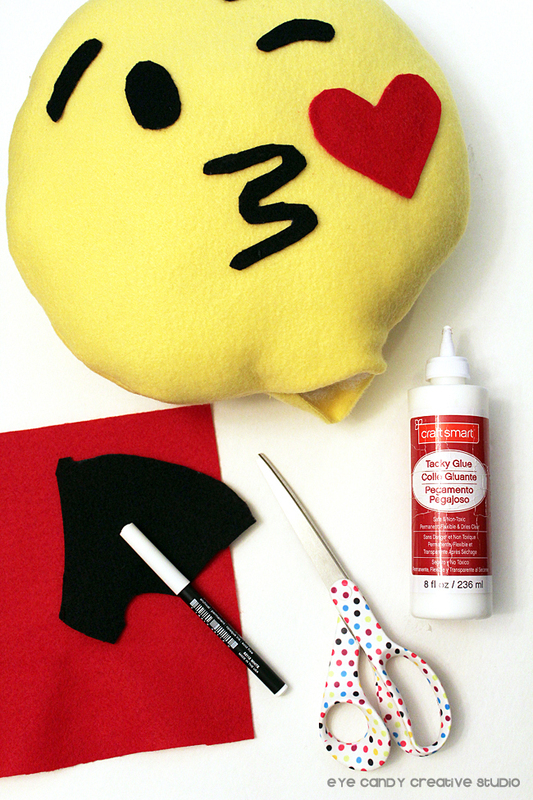 6. decorate - using the various colored pre-cut felt you have, choose the emoji face you wish to create - sketch out the shapes on the felt and then cut them out and apply to your pillow using the glue gun or fabric glue. 7. hand sew the opening closed - we did this step last as some wanted more stuffing in their pillows and also this gives the girls a chance to hand sew their faces on easier - if they choose to reinforce them. 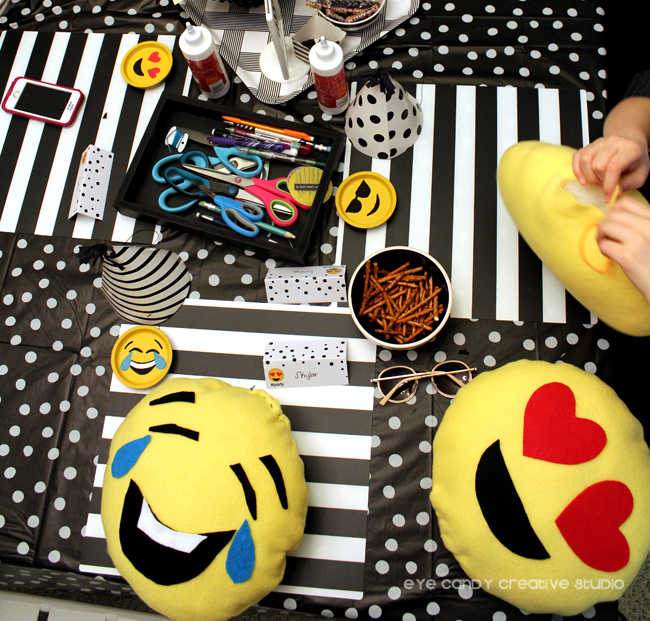 This is the perfect DIY craft for an emoji party or an emoji sleepover. I also believe this can be done with younger kids as well, just help supervise and you are all set. 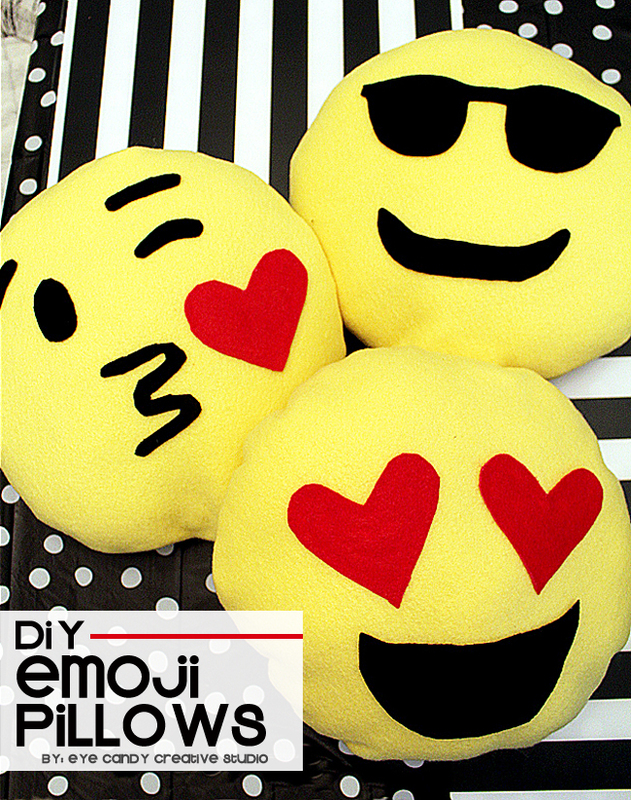 What emoji face would YOU make for your pillow, given the chance? Please let me know below . . .
My little one would flip for these. He is soooo obsessed with emojis right now. Such a great idea! All people of ages would love having one of these cutey pillows. It would be fun to make them together. 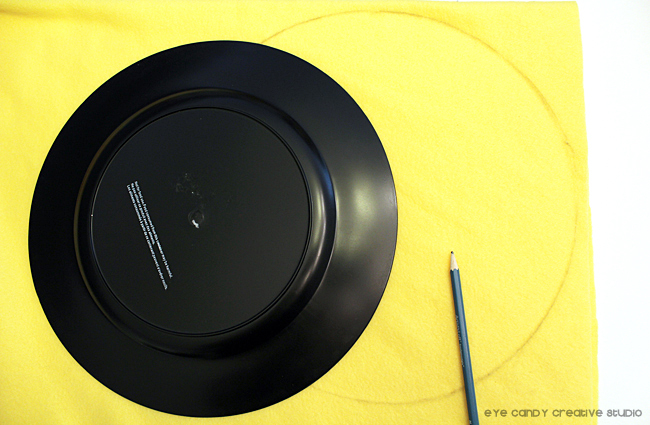 What a great DIY project . I like that you don't need sewing skills to do this. This is so smart and creative. They sell these things in stores for so much, it's nice to see a DIY version. You can really personalize these in so many ways depending on the mood. Those are the cutest things ever! I would love a whole couch full of them! These are so much fun! Perfect for a teenagers room! Oh these are too fun! Great idea. I have to show this one to my daughter. My little girl just got a similar one from her McDonalds happy meal. She would love it I made her more. Oh my goodness -- this is such a fun party idea! My favorite emoji is the dancing lady, so now I feel inspired to recreate it! Both my eldest and my dog love these little pillows. I'll never understand it,but at least now I can make them some original ones. Oh my word. These are just so cute! My daughter is obessed with the tiny ones in the happy meals right now. It would be WAY more fun to make htem! How fun are these!!! My son loves emojis; I'm going to have to invite him to make these with me. He'll be thrilled! Oh my gosh I need these in my life! So so so cute! What a fun idea for a party! You're so emoji creative. I'm not surprised. I love your polka dot scissors. Now this is a super cute idea! I can see us making smaller ones so the kids could cover their whole bed with all of the emoji's that they love so much. Adorable!! These are adorable! 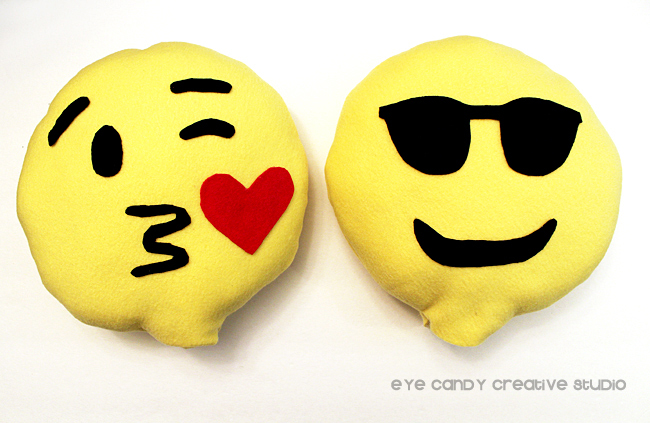 My kids love emojis and I think they would absolutely LOVE these! I think that my daughter would love to participate too. I've already announced (in several places) that I love everything about this party. 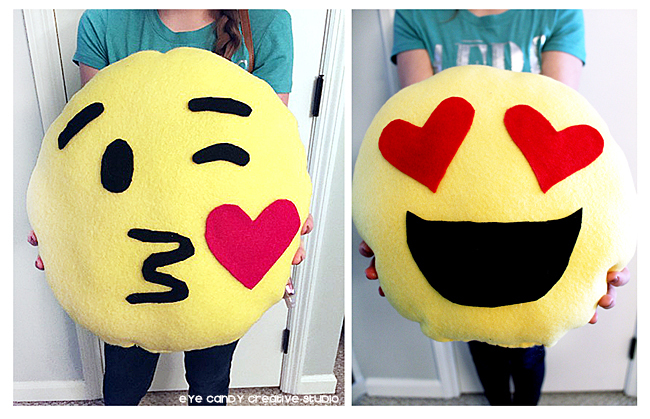 It's so awesome that you also made these cute pillows! What a great idea. Thank you for the instructions. These are so cute! I bet kids would really enjoy making these and decorating their rooms with them!